We’re honored to be recognized with so many great companies and thought-leaders in Customer Service. 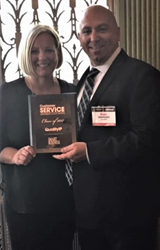 QualityIP, a regional leader in IT Services, was presented a 2017 Customer Service Award today at a luncheon in Cleveland, OH. The luncheon is held annually. Today’s event honored 24 companies in Northeast Ohio who have made outstanding customer service a priority in their business. Over the past year, each company has raised awareness of the importance of exceptional customer service among their employees and the community at large.